Available as CalcuPak 1 and 2 Software or as hard copy materials. Drills, Answer Keys and Achievement Record documents in printable forms. 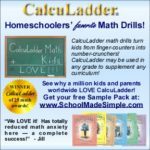 Dr. Myers’ math program, CalcuLadder®, consists of a total of 6 books, containing a series of drills that build on previous ones, providing a daily review and new material as well. This reinforces all of the concepts being taught in a seamless learning experience. There is a Bible verse on each drill and a quick grading feature for parents. The student repeats a daily drill until s/he can complete it correctly in the time goal parameters. The fact that the child is expected to repeat the drill a number of times removes the pressure of “getting it right the first time” and makes working the drills enjoyable. Once the drill is completed within the time goal, the parent records the achievement in the Record provided and next day, the student moves on to the next drill. Dr. Ed’s Assessments will allow parents to see weak areas in a short time and provide guidance to strengthen the weaknesses. There is no need to ever wonder if your child is doing well or not. Dr. Myers’ Penmanship program, ReadyWriter®, for 4- to 8-year-olds, addresses the need to develop fine motor skills and fine muscles in the hands by providing exercises in the six strokes that form letters and numbers. Rather than traditional lined-paged penmanship, where the child has to practice writing out boring letters or sentences again and again, the ReadyWriter has pages of beautiful drawings that are missing key parts. A story goes along with each drawing. The child must fill in the missing parts of the drawings. They are actually practicing letter formation without knowing they are doing so, and they do not become tired or bored with having to make full letters to accomplish the tasks. This makes penmanship and stylus skills fun for the child! The Myers’ Dictionary Skills section, AlphaBetter® for 3rd grade and up, is designed to take a full school year to complete. Dr. Myers has insightfully developed timed drills that teach the user to be able to identify a letter’s place in the alphabet without having to use the Alphabet Song from the beginning! This makes it useful for adult use as well in looking up words in the phone book or in the dictionary. It is also available in a hard copy pre-printed form to allow re-use of the drills. Finally, there is the Bible books memory builder, SanctiFinder®. For Christian parents, making it easy to navigate around the Bible quickly is important. The SanctiFinder uses timed drills and memory tools to allow the student to commit to memory the order and spelling of all 66 books of the Old and New Testament. The School Made Simple products are reasonably priced and high quality. CalcuLadder, ReadyWriter, and AlphaBetter are available in two formats: 1. CalcuPak software allows the parents to easily print out the drills as they need them. It is useable with more than one child and it can time up to 5 kids at once! 2. For parents who do not have a computer and printer at home, the materials can still be purchased as hard copies and used with the brand new plastic overlay device, the SuperSlate™ that allows your student to write on the clear plastic sheet overlaying the worksheet, then allows you to grade the worksheet on the overlay and erase it with some petroleum jelly and a cloth, ready to use again! This is an excellent way to provide flexible, repeated responses to the hard copy worksheets. Please visit the website at your earliest opportunity to investigate Dr. Ed’s line of learning materials for yourself! www.schoolmadesimple.com – E.S.